Almost everybody we interviewed for Pinoy Organics acknowledge Gil Carandang as their mentor and/or inspiration in the field of Philippine Organic Farming. Gil is regarded by colleagues and students in the agricultural community as the “Father of Philippine Natural and Organic Farming”. He is a graduate of the Apprenticeship program on Ecological Horticulture, University of California Santa Cruz. He is a full-time farmer and owner of Herbana Farms and an Organic Certification Center of the Philippines (OCCP) inspector. He studied under John Jeavons of Ecology Action in Mid Peninsula in California on Sustainable Bio-intensive Mini-Farming and under Dr. Han Kyu Cho of Korean Natural Farming Association on Natural Farming Systems for Crops and Livestocks. He was an apprentice with Natural Farmers of Japan as well as at the Center for Agro-Ecology and Sustainable Food Systems (CASFS) of the University of California Santa Cruz in the field of Ecological Horticulture. He attended workshop on Biodynamics preparations with Biodynamics Association of Northern California and Permaculture Design Course with the Center for Natural Design, Los Osos, California. He extensively lectures on beneficial indigenous microorganisms both in the Philippines and the United States. He brings the technology of using indigenous microorganisms as another tool for farming sustainably. People who have attended his seminars say that Gil is an extremely engaging, fun, and empowering teacher. We were able to witness this when we met up with him in Salcedo Market few weeks ago. He was just unstoppable and it was almost impossible not to get inspired by this simple man to start farming, with or without hectares of farm land. The supposedly casual 15-minute chat lasted for about an hour that we almost forgot to buy his vegetable produce for our weekly consumption. After securing our basketful of organic vegetables, we bid him goodbye. There was a commotion few minutes after we left his booth. 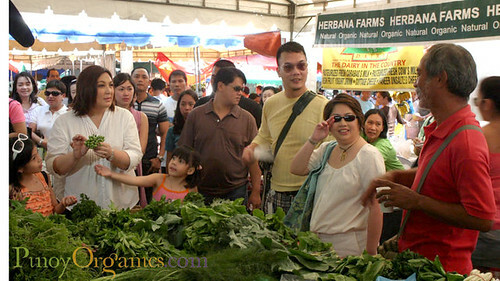 The Mega Star Sharon Cuneta interviewed the Mega Farmer about his farm and the wide variety of local produce on the table of the Herbana Farms booth. Gil, as always, enjoyed explaining to Sharon the uses, benefits ad taste of each herb, vegetable and fruit she picked from the table. If there’s one question that you can ask Gil, what would that be? Plan to have an organic vegetable garden in my side yard. (back yard is for drying clothes, front yard is the usual lawn) If he can provide 5 best practices in setting up a home veggie garden and 5 best practices to organically control pests. The literature out there can be utterly confusing to a newbie like me. Thank you. Gardening is my passion. I started gardeing since I was 6 years old. Now, I am thinking of early retirement at 55 and I want to go back to gardening. After reading the write up about Mr. Carandang, more so I become very interested in gardening and this time, organic gardening. Hope I could join in one of the events of pinoy organics. Kudos to the organizer of pinoy organics. 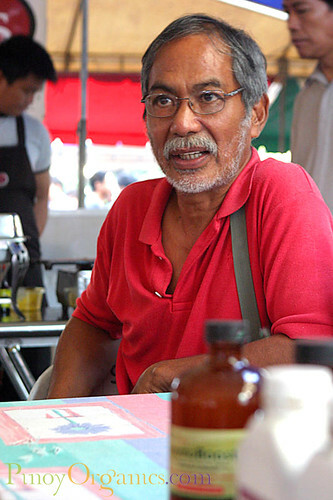 may i know how to get in touch with Mr. Gil Carandang, if he has seminars for organic farming? i am very interested to join. I would like to know if you will be having a seminar about organic gardening. I am interested to attend. Thank you. Hi Tisha. Check out our events page for the schedule. Check out our events page where we will post all learning events about organics. Hi, I am interested in organic farming, is there any seminars I can attend n persons to talk to? I am one of his trainee, he is a good mentor, i learned a lot about organic farming. now i have my owned small organic farm my veg.produce displayed at country mall,and i distributed some veg.dealer. There are several workshops and trainings. Subscribe here and join our Facebook page (Pinoyorganics) so you don’t miss them. Regularly check our calendar of events. Please let us know when you could give a seminar in bacolod city. especially how to start one. I am conducting a 3-day seminar at the Herbana Farms km. 59, brgy. Burol, Calamba City this Aug. 31-Sept 2. INTENSIVE MICROBIAL ORGANIC FARMING AND NATURAL PIGGERY & POULTRY. My cell: 09292698602 rsvp. How can i contact Mr. Carandang? I would like to learn organic farming in my home.